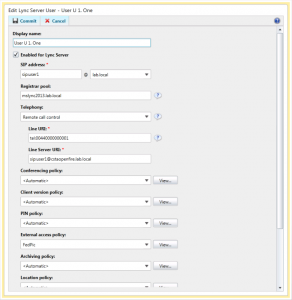 This post will go through the steps required to set up Remote Call Control between a Lync Server, and telephony plugins sitting on an Openfire server. This uses our “CSTA Plugin” for Openfire. 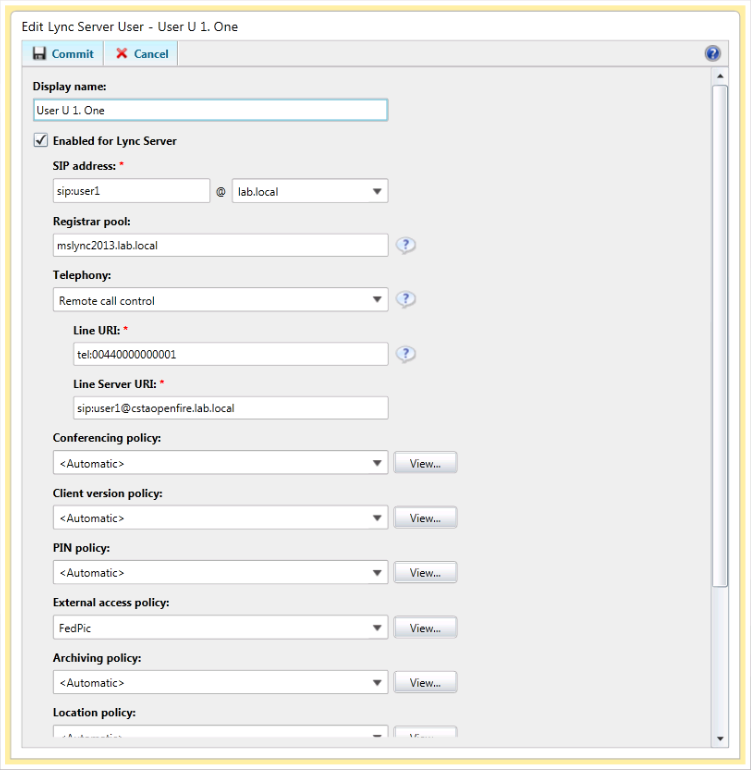 The first step is to configure a Static Route on the Lync server which goes to the Openfire server. This is done from the Lync Server Management Shell. The “$1″ represents the variable name used above. This will return all identities and routes configured for them. The next step is to configure the Openfire server as a Trusted Application Server. Once again, this is done from the Lync Server Management Shell. 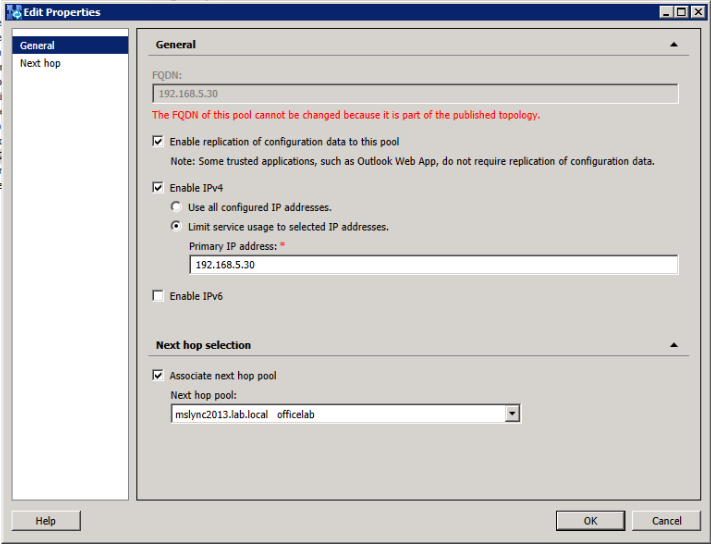 After configuring Openfire as a Trusted Application Server, you need to make a change to it in the Topology Builder. 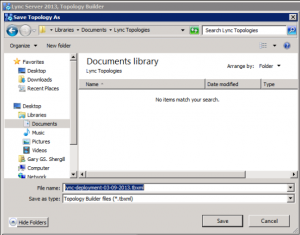 To do this, run the Lync Server Topology Builder. When prompted, select “Download Topology from existing deployment”. This will begin to download the topology. 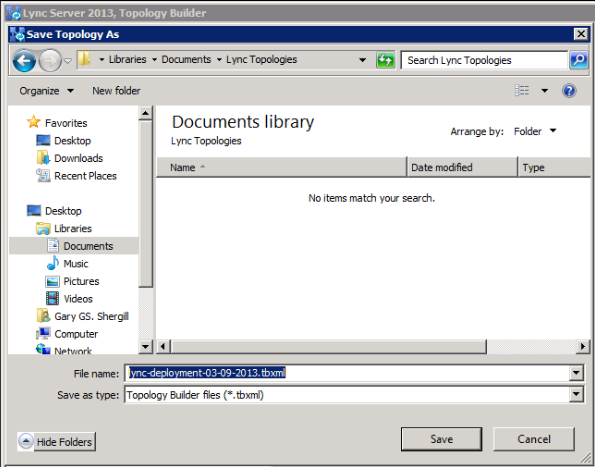 When asked where to download the topology, you can select any location and file name, but do not change the format. This will load you current deployment. Collapse the left side menu to find the folder “Trusted application servers”, which should have the just created Trusted Application Server listed. 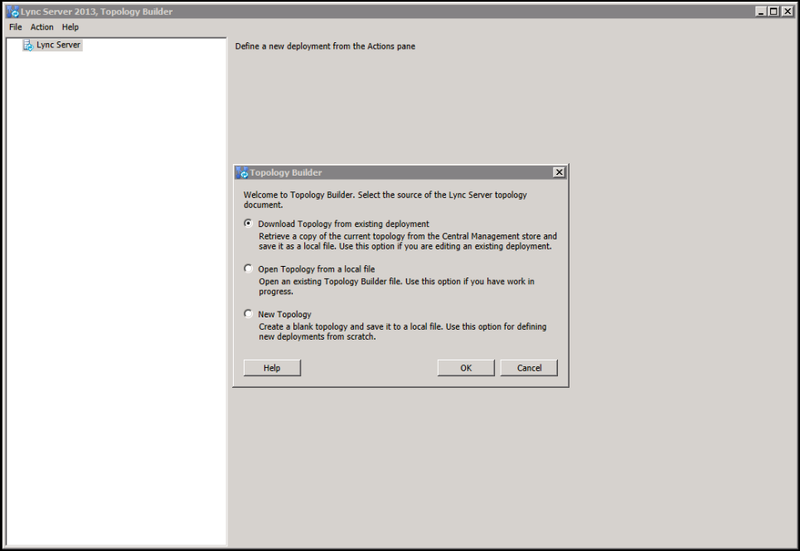 Right click the listing and select “Edit Properties…”. 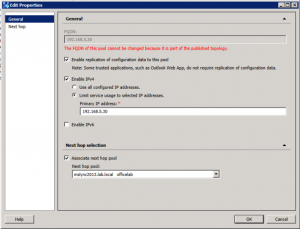 Here you need check the box “Limit service usage to selected IP addresses” and enter the IP of the Openfire Server in the field under “Primary IP address: *”. Now you need to publish back the Topology with the changes. 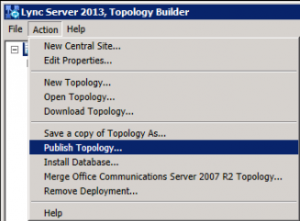 In the Topology Builder, click the “Action” menu and select “Publish Topology…”. Click “Next” and and it will publish the topology with the changes made. It may be a good idea to save this somewhere as a backup. Now that you have made the changes required to the backend Topology, you need to edit the users to allow Remote Call Control. First, run the Lync Server Control Panel. When this loads, log in and click the “Users” tab on the left hand side. This displays all users configured for Lync. Once done, select Commit at the top of the window. On the Openfire side, you will need to add the CSTA plugin. This can be done in one of two ways, like any other plugin. 1. On the Openfire Admin Console go to the Plugins tab and add the plugin from there. 2. Stop the Openfire server, move the plugin into the plugins directory, and start the Openfire server back up. 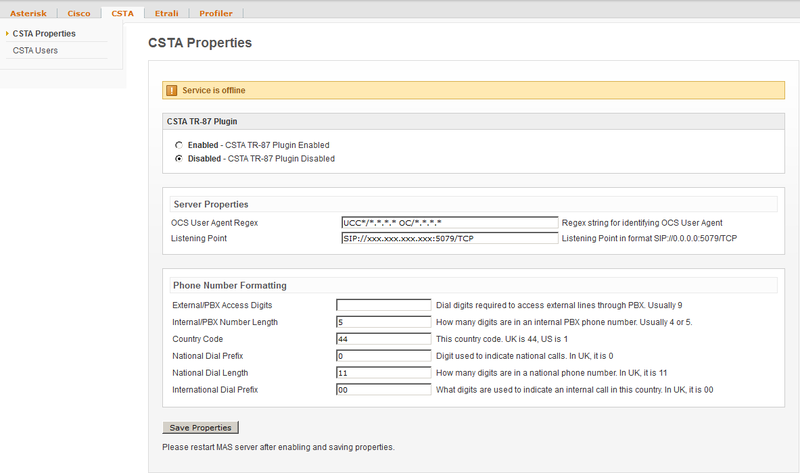 Once done, the CSTA configuration page will appear in the Admin Console under the tab “Unify”. 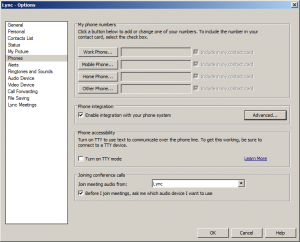 If you are using any of our other telephony plugins (e.g. Etrali or Cisco), it will appear alongside those, otherwise it would be in the Unify tab on it’s own. 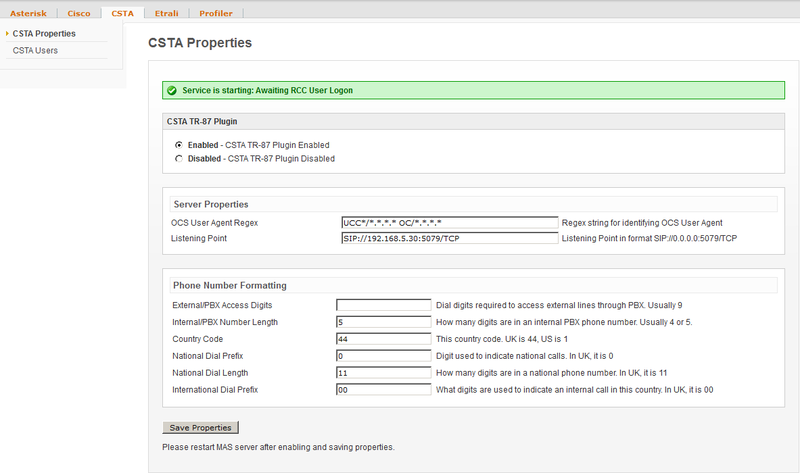 Click on the CSTA tab to view the CSTA Properties page, where you can configure the settings for you setup. Here you need to change the listening point to match your setup. Other than this, the other settings can be left as they are. Once the change is made, click “Save Properties” and then restart the MAS. When you go back to the page it should be green and say “Service is starting: Awaiting RCC User Logon”. This means that the plugin has started is waiting for a user to log on. 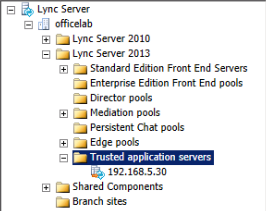 Now you are done with the Openfire side, you are ready to log on to the Lync Client. Log on as normal, and once done go to the Options menu, and to the “Phones” tab. 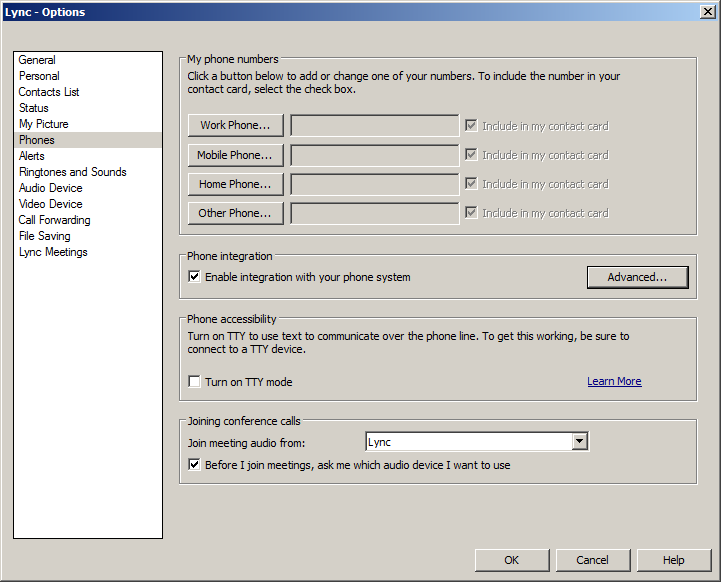 Here you need to check the box “Enable integration with your phone system”. Then click the “Advanced” button and ensure that “Automatic Configuration” is checked. Log out and back in to the client, and the change will take effect. Check the Openfire Admin Console now and you’ll see that “Service is starting: Awaiting RCC User Logon” has changed to “Service is online”. In addition, if you go to the “CSTA Users” menu on the left side, you’ll see the user logged in, the system he is using, and his “Device Name”. If the device name is listed, with the correct “tel:#” configured in the Control Panel, then the user will be able to dial out using their configured system.